Home Costs > How Much Do Marble Countertops Cost? Marble countertops, as the name implies, are made out of marble, a type of stone that is also used for flooring and other decorations. Known to be extremely durable, this material has been used for centuries. How much are marble countertop prices? Depending on the type, the size, the grade, your counter setup, the current market conditions, where you purchase it from and who installs it, the prices can vary. On average, marble countertops can cost anywhere from as little as $40 to more $125 per square foot installed if there are a number of cut outs and a higher edge detail. Most of the time, the grade will affect the pricing. For example, a white Carrara marble countertop will be the least expensive type on the market, while a Calcutta marble will be the most expensive type since it has a dramatic contrast when compared to other brands. We talked to a few suppliers and were able to get slab prices priced by the square foot. The prices noted in our table below for the slabs only and won’t include professional installation. The average home buyer purchases about 50 square feet for their kitchen. Faith Durand over at theKitchn.com shared her story about how and why she chose marble and said she paid $3,000, about $50 per square foot, to have it honed and installed. She also paid an additional $600 to have the sink cut out and an eight-inch backsplash. Some members on Houzz said they were quoted anywhere from $113 per square foot fabricated to $45 per square foot in Pennsylvania. Carrara marble will be the most common option found at a local building supply retailer and is quarried in Carrara, Italy, hence the name. This is the least expensive option, as previously stated, and won’t have as many veins and vibrant colors as a higher grade. Other grades you will see on the market will include Calcutt and Danby. A slab will either be two, three or five centimeters thick, and most slabs on the market will be three centimeters thick because of its strength and total weight. Marble will be classified from A to D. Like school, the higher the grade, the better it will be in terms of “viewing.” An A grade will have very few flaws and subtle veining, while a B rating may mean there are few flaws but it may contain visible pitting. C means the material will have flaws that are factory repaired, but these repairs may be visible. Lastly, a D rating means the veins will be dramatic and the colors will be brighter than most. The two most common finishes you will find will either be a polished marble, which results in a glossy appearance or honed marble, which will leave the finish in more of an opaque, satin finish. If the marble has to be honed, the top layer of the marble will be removed, but regardless of the finish, it will protect it from staining. Edging options can either be two or four centimeters thick and can come as the following styles: eased, bevel, bullnose, double radius, half bullnose, double bevel, double ogee, ogee, ogee bullnose, step half bullnose and triple pencil. Most companies will include three to four standard edges, but if you want to upgrade, additional costs may apply. The average countertop install for a basic kitchen will be around eight to 10 hours. A sink cut-out can cost an additional $400 to $650. A stove cut out can cost $100 to $150 per hole. Electrical outlet cutouts can cost $25 to $50 each. Installing a new backsplash, which is often done during a countertop installation, can cost an additional $20 to $30 per square foot. Some companies may charge to haul away your older counter material. For example. Home Depot charges $13 per square foot to remove stone or tile and $8 per square foot for any other surface. Marble countertops will have to be re-polished and treated regularly to keep its appearance and protect it from etching, a problem often caused by non-abrasive cleaners and hot dishes being set on the countertop’s surface without using a hot pad. It’s important to maintain it annually to keep its “like new” appearance. Sealing a counter professionally can cost anywhere from $150 to $300. Upgrading your edging can cost an additional $10 to $35 per linear foot. 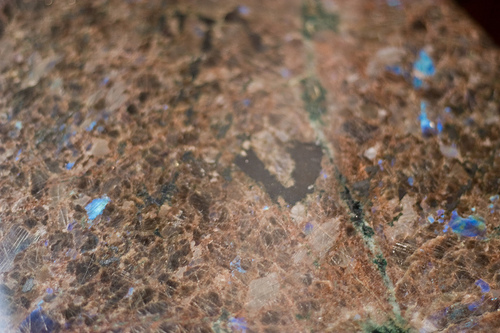 While marble can be very pleasing to the eye, it’s known to scratch, stain and etch easily, especially if it’s white. Water and soap is usually all you need to remove any stain on its surface. Play around with the Home Depot countertop estimator to see what your job may cost. Before choosing a company, know what kind of guarantee you’re going to get. When buying, see how long delivery and installation will take. If your counter has to be put on a special order, it could take six to eight weeks before it arrives at the warehouse. If purchasing online, closely examine the reviews from previous buyers to see what they have to say. Pinterest has 1000s of kitchens with marble countertops to offer you some inspiration. Most suppliers will offer a sample for you to take home, but don’t rely solely on this sample to make your decision. Before comitting, head to the supplier to look at the actual slab that will be installed in your home. Counters come in all shapes and sizes. While marble can be one of the most expensive options (for a good reason), consider other material such as laminate or butcher block. This material, if done right, can make your kitchen look just as good and will be at a fraction of the cost. When looking for a contractor in your area, consider getting multiple quotes for free from websites like HomeAdvisor.com. Always try your hardest to get at least three quotes before deciding on a contractor. Retailers will often be much more than a local quarry. If you can, try to look at a local quarry before considering a local retailer. Mable in stock will always be cheaper than having to special order it. Don’t forget about sales. Many suppliers, like retailers, will commonly hold sales on older slabs they are trying to get rid of or a discount off your purchase. Using the supplier’s preferred contractor can often save you money.